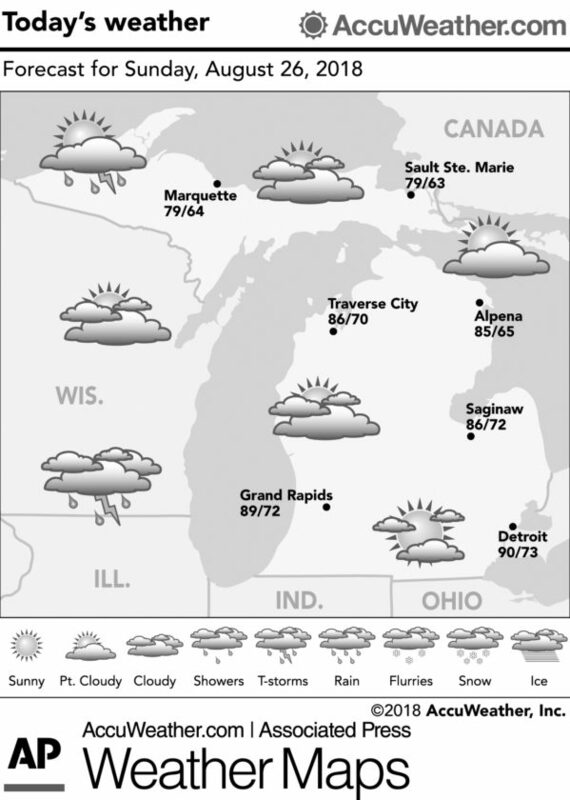 Marquette and vicinity: Today, a chance of showers and a slight chance of thunderstorms in the afternoon. Partly cloudy. Highs around 80. Light winds becoming south 5 to 10 mph in the afternoon. Chance of rain 40 percent. Tonight, warm. A chance of showers and thunderstorms in the evening, then showers likely and a chance of thunderstorms overnight. Cloudy. Lows around 65. South winds 5 to 10 mph. Chance of rain 60 percent. Monday, warm. Mostly cloudy with a 50 percent chance of showers and thunderstorms. Highs around 84. Southwest winds 10 to 15 mph. Monday night, showers and thunderstorms likely. Lows around 63. Southwest winds 5 to 10 mph. Chance of rain 70 percent. 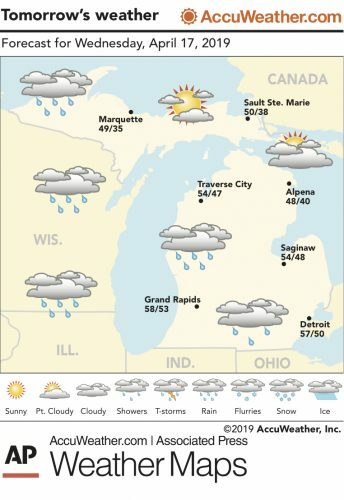 Extended forecast: Tuesday, cloudy with a 50 percent chance of showers and thunderstorms. Highs 71 to 76 inland to around 70 at the shore. Tuesday night, a chance of showers in the evening. Cloudy. Lows around 55. Chance of rain 50 percent. Wednesday, cooler. Partly cloudy. Highs around 64. Wednesday night, clear. Lows 47 to 52. Thursday, mostly sunny. Highs around 72. Thursday night, partly cloudy. Lows 53 to 58. Friday, a chance of showers in the afternoon. Partly cloudy. Highs around 74. Chance of rain 40 percent. Friday night and saturday, mostly cloudy with a chance of showers. Lows around 58. Highs around 75. Chance of rain 50 percent. Lake Superior: Sunday, southwest wind less than 10 knots backing southeast in the afternoon. Partly cloudy. A chance of showers and a slight chance of thunderstorms late. Waves calm to 1 foot. Sunday night, south wind 10 to 15 knots. Mostly cloudy. A chance of showers and thunderstorms through midnight, then a chance of showers and a slight chance of thunderstorms after midnight. Waves building to 1 to 2 feet. Monday, south wind 10 to 15 knots veering southwest 5 to 15 knots by mid afternoon. Mostly cloudy. A slight chance of showers and thunderstorms through early afternoon, then a chance of showers and thunderstorms by mid afternoon. Waves 1 to 2 feet. Temperatures: The average temperature Saturday at the National Weather Service office in Negaunee Township was 66 degrees, 3 degrees above normal. The high Saturday was 71 degrees and the overnight low was 60 degrees. 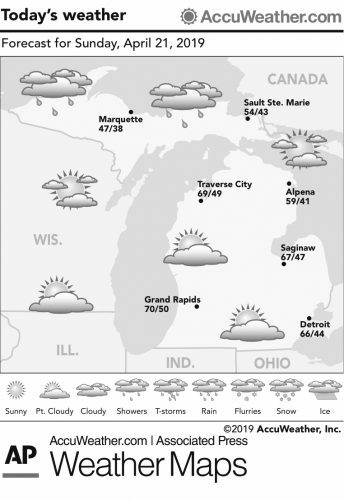 Precipitation: Saturday, .09 inches. Year to date, 22.35 inches. Normal to date, 21.77 inches. Sunset: 8:40 p.m. this evening.